As an EMT or medical professional, you desire a watch that is easy to read even in dimly-lit situations. You also want it to be very precise In order to get an accurate pulse, lightweight and comfortable because you’ll be wearing it for a long time. The following are the best watches for EMTs you should know about. 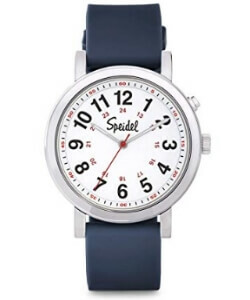 This Speidel Scrub is a good watch for someone looking for a reliable and durable watch. It has a moderately large dial with well spaced Arabic numerals. The second hand is also easily noticeable and taking pulse reading should be much easier. The unit is lightweight and has a slim profile. It won’t add undue weight on the wrist, which may hinder your comfort or movement, especially during the long shift. Many Consumers say it has good accuracy and can handle everyday use, bangs, abrasion, movements, and shock well. Cleaning the smooth and sleek finish on the stainless steel case and gel wrist band is not hard. This timepiece has a simple face for easier reading. The spacing of the numbers is also decent so is the nice contrast between the hands, numbers and the dial. It’s felt lightweight and also has a smooth texture which doesn’t scratch the skin. It also doesn’t fade or lose its appeal over time. The watch feel strongly built and handling everyday use, accidental bangs or falls, abrasion and the elements should not be hard. It wipes/ cleans easily and has a smooth movement for accuracy. This has to be among the most comfortable EMT watches out there. It feels super light and the finish, both on the stainless steel case and rubber band, is very smooth. It doesn’t add any weight on the wearer and stays firm on the spot. No movement, no digging into the skin, no abrasion. Reading it is easier than most out there. The second hand is very visible just like the Arabic numerals and markers. The silicone bands are also very flexible and strong at the same time. They feel nice on then hand and are hygienic. This combats bacteria, germs, dirt, stains, and oils and also improves cleanup. The last thing you want is misreading a patient’s heartbeat or pulse rate. This may mean giving the wrong diagnosis or subjecting him/her under more tests. A good product is very precise and will maintain its good performance for a long time. To improve on this, it will feature large numbers to minimize the possibility of errors. A good approach is going for well-known and reputable brands. Going through reviews also helps to get insights on a particular piece. 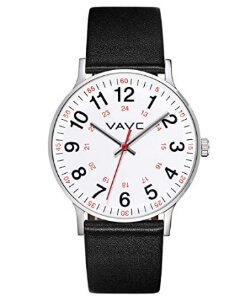 A good watch is simple and easy to read. It has a fairly large face and the numbers are easy to see. Digital watches with Arabic numerals are preferred over others since they are easier to read. Dark hands and numbers on a white dial/background also improve visibility. The second hand should be extra visible since it’s used more often than the other ones. The top picks will have only the necessary details as this prevents a cluttered face which will require the user to concentrate more. Medical professionals including EMTs will wear the watch for long durations. The shifts will at times be very long and the last thing you wish for is your wrists feeling tired because of a heavy watch. Also, you don’t want a piece that bogs you down or keeps shifting position as you carry on with your work. The most suitable choices are very lightweight and also fairly slim. They also have smooth finishes which enhance comfort. 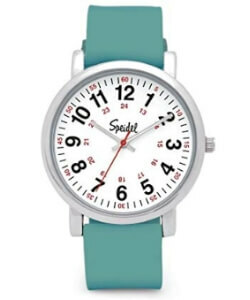 Although lightweight, the watches should be strong to resist scratches, dents, chips, cracking, wiping, and other things. The right product feels comfortable on the wrist. The case, back plate, straps should all be smooth and won’t scratch or dig into the skin. Also, they should be lightweight and won’t encourage sweat buildup, have a sticky effect, or leave marks on the skin. Rubber and resin bands feel more comfortable than steel or leather strap. They also are more flexible and much lighter. And you should know that good straps will be hygienic and easy to clean. They won’t hide dirt, dust, oil, germs, grease, bacteria and other things. Also, they are easier to clean. Smooth texture is preferred over a rough or a mesh one.